Well, technically these could be antelope cookies or star cookies or platypus cookies or… well, anything. Although I challenge you to find a platypus cookie cutter. 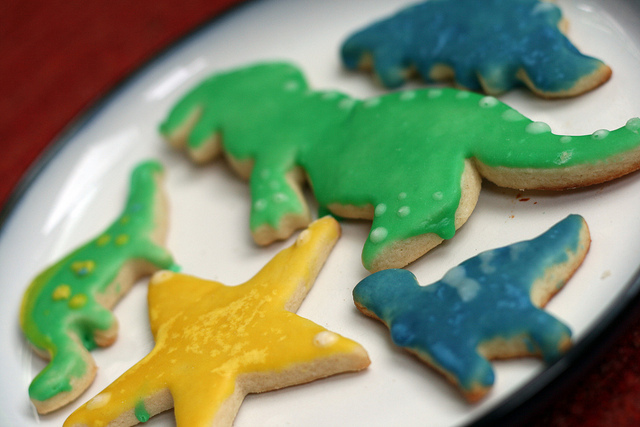 Baking sugar cookies is guaranteed to make your inner child very, very happy. So dig out your cookie cutters, rolling pin, and food coloring, because you’re in for an evening of unbridled, floury fun. This recipe is adapted from Jill’s “The Best Rolled Sugar Cookies“, and the icing comes partially from this excellent recipe. Best of all, it makes 60 cookies, because–let’s face it–it would be silly to make any fewer than that. You’d have to eat normal food groups again after the first day! Bake 6 to 8 minutes in preheated oven. Don’t be afraid to take them out even if they look a little pale; they’re probably done and will even cook a little more on the baking sheet. The great thing about these cookies is that you can cook longer for a golden-brown, crunchy cookie or a bit shorter for a pale, soft cookie. Most of the ones I made were on the soft side, and extremely delicious. Cool completely.3 On to the icing! NOTE: I ended up substituting almond milk for the cow’s milk, and a splash of vanilla extract instead of almond extract. Handy if you don’t have almond extract, or have to nourish a local vegan with leftover milk. Store extra cookies in an airtight container to maintain freshness. Unless you can eat all 60 immediately. Please don’t do that. Most people don’t know this about me, but I have more cookie cutters than Mrs. Claus. Printing this out today and trying the recipe out tonight. I’m thinking sesame street cutters.